In a tiny shack made with tin slates and bottle caps, Michel St. Anne spends her days tending to her grocery and snack shop. Michel started her business in 2008 when she used to live in downtown Port-au-Prince with her husband and three children. Before starting a grocery and snack shop, she would sell clothing detergent on the streets of Port-au-Prince. Sometimes she would cook food, such as roasted chestnuts, and take to the streets of the city to sell them. 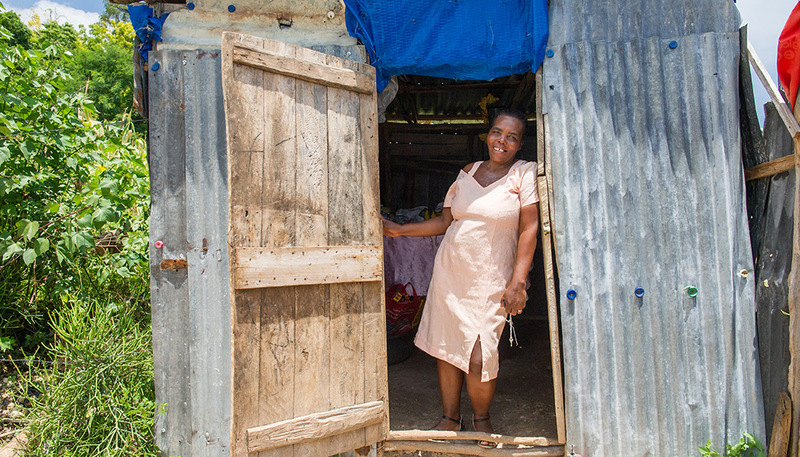 After the devastating earthquake of 2010, Michel and her family lost everything. “It was the hardest time of my life and I was not able to manage my business well,” she says. The family moved to her husband’s old neighborhood, in the quiet hills of Carrefour, Haiti. As the family built their new home, Michel longed to start her grocery business again. After building a tin shack on the side of her new house, she was back to running her business. Within years of restarting her grocery shop, Michel needed funds to keep her small store stocked, but did not know where to turn to. She heard about FINCA’s small loans from her neighbors who invited her to join their Village Bank group. After receiving her first loan in early 2015, Michel was able to restock her store with grocery items and chestnuts. “The loan from FINCA helped me to move forward as I didn’t have any assistance from anywhere else,” she explained. With the help of a second loan from FINCA, Michel has had a great impact on her community. In her hilly neighborhood, access to clean water is limited. Community members have to travel far to access clean and safe water for their homes. Michel and her husband built a large tank near their home to store clean water. The tank is regularly filled via a truck from a water company. She then sells the clean water by the bucket to her neighbors and the laborers in the community. Michel has dreams for her small store. In addition to growing her inventory, she longs to house her products in a concrete structure. In the sweltering summer heat, Michel finds it very uncomfortable to work in her shack. Until then, she happily supports her family with her grocery store and water tank businesses.